This client happens to be my husband. I really don't get much in the way of payment from him, but he is awfully patient with my time schedule! He has a very long torso and a large neck size. 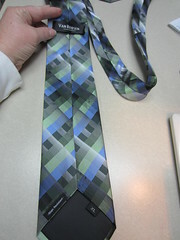 These two things combine to make it a real challenge to find ties that fit . When we find something that's close, I can work some magic to help the tie look longer. 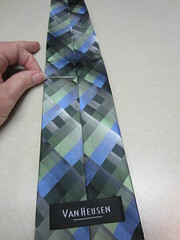 Here is the tie as it originally came. Although it says XL, it really is not much longer than a regular size. Of course I have already had him try on the tie. He tied it so that the finished length is correct. That means that the smaller part underneath is really small and doesn't reach the label. I start by removing that label. Then I move the label to the spot marked in the first photo. 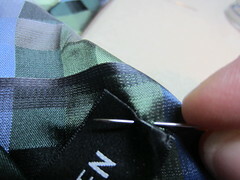 Hand stitching is fine for this minor operation. And here is the finished product. It's the best way to make a bad situation better. 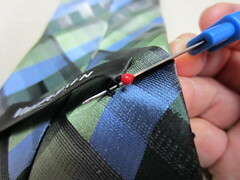 Tall ties are not very easy to find, and when you do find one, you better like the style...and the price. This way he gets more variety and it's easier on the wallet.